3 Ocicat Classic Kittens .gccf Registered. 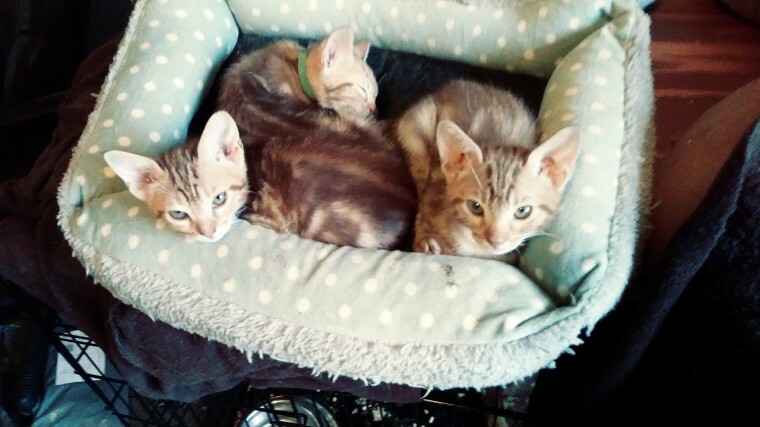 We have 3 Ocicat Classic Kittens ready to go on 9th November. looking for their forever homes. as pets. .....Before reading further. beware you will be interviewed by Mum and our other Queens and our Neuters...... 1 is a Chocolate Girl .The one with the yellow collar. 2 are Cinnamon Boys. Very active hence picture quality. These friendly outgoing kittens have been born indoors .Our bedroom. and raised in our living room. with their mum and our other queens and neuters. They will be.. Fully GCCF Registered. once you have given them a name. They have been declared to GCCF but not named. our naming guideline will be explained when we meet you. They are.. Vaccinated .Full course of 2 injections. Wormed Flea treated They will be microchipped. Both Parents can be seen. We at Thor..s Oak take pride in the fact that we have no PKDef or PRA in our lines.